With all of that being said, Mother's Day is upon us, and in only a few short days! Meaning, if you were waiting to see what I would post for your gift ideas, it's crunch time... and you better decide ASAP! Now, just because it's Mother's Day doesn't mean you have to purchase her a gift? In fact, my Momma decided that this year, she only wants a picnic lunch... from all of us, and to simply spend time with her, (like she doesn't get enough of us)? I am not sure if this was a trick or not to decide on favorites, but Momma is pretty good about letting us know when and if, on the rare occasion... that she really wants something. So just remember, it's the thought that counts! I am sure that we will decide that a party is in order, with a few little DIY giftsperations, Momma has a green thumb, loves all things vintage, is quite the baker and loves a good crafting home make over! 1. Blooming Monogram - This could be great for an office, for a Mother's Day Party, or simply to show your mom how much you love her! This is a fun and crafty way, to add color and beauty into any Mother's life! 2. Cedar Street Perforated Monday: Kate Spade - This bag, or any bag, that is reasonably priced, could be a great gift for your high fashion Mother! 3. Kendra Scott Earrings - Kendra Scott is all the rage, they are also simple, fun and beautiful earrings for the mom who loves to dress to impress, or just look good while driving you around! This is a great and affordable Mother's Day gift! 4. The Best Mom Card - Any cute and fun card will do, this one just caught my eye because I love the elegance / vintage girl chic feel. Obsessing over all things water colored. 5. Chloé Perfume: Chloé Eau de Parfu - This perfume is beautiful, it's classic and it screams B E A U T Y... and who doesn't want to feel beautiful on a day dedicated to them being a Mother to beautiful children? 6. Flowers - Flowers are a must, but they are also usually picked over by the time Mother's Day arrives, so order early, have them hold them in the freezer until the day of - - - and then tip well. They are helping you by holding them, you just get them in the best condition without having to stand in line at Target with the 46 others who forgot. 8. Charbonnel et Walker Pink Marc de Champagne Truffle Heart's - These are a delicacy... they are also to be ordered from Bloomingdales. When in Rome, these are the bee's knees. These treats are beautiful, tasteful and wonderful. You can never go wrong with this gift. 9. Photo Wrapping - Now, yes... you do have to put a gift inside but these are just the cutest! Please do this and thank me later, I just love the simplicity of this beauty that the gift holds, it makes me never want to open the box. How are you planning to celebrate your Momma this Mother's Day? 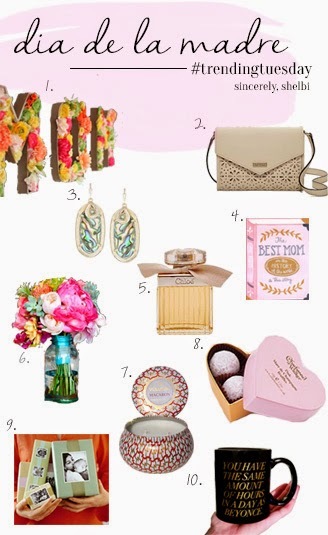 Share some of your favorite Mother's Day idea's below!